Donkey Sanctuary Bonaire is committed to offering a safe life to all of Bonaire's donkeys. It also provides the island's inhabitants, schools and tourists with education about the donkey's habitat. Currently, Donkey Sanctuary Bonaire houses over 600 donkeys. They are provided with food, drinking water and medical care and enjoy plenty of space and freedom. You are more than welcome to pay us a visit at Donkey Sanctuary Bonaire. We would love to welcome you at our shop in order to explain what we do. You can also purchase great souvenirs, the proceeds of which, of course, fully go the the donkeys. Next, you can take your own car for a drive between the hundreds of donkeys at our large park. The animals will gladly come to you and stick their snouts inside through the car's window, hoping you'll have brought them a treat. If you want, we offer carrots for sale to feed the donkeys. You can be sure to make dozens of new friends very fast! The special care meadow can only be accessed by foot. This is where you'll find those donkeys needing special care, for example due to an injury or illness. The meadow is where we keep mothers with their foals and orphaned foals which we feed by means of a bottle. In addition, we feature a garden where you can admire iguanas and tortoises. Lastly, you can order a drink and take a seat at our cozy terrace, in the shadow of pala roof made of dried palm fronds. From here, you'll have a beautiful view over our salt lake, where flamingos can usually be seen. All in all, a great and educational day out for young and old! 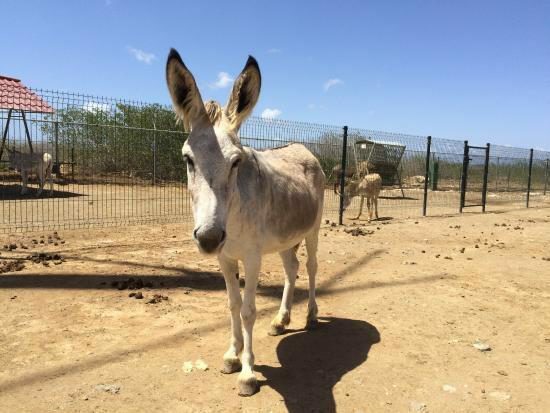 Donkey Sanctuary Bonaire is open to visitors daily from 10:00 until 17:00. Entrance is possible until 16:00. Driving around is allowed by car, scooter or bicycle. Walking around is a possibility as well, of course. Quads are not allowed inside the park. The entrance fee is US$ 7 for adults. Children up to the age of 12 only pay US$ 3.50. Adoptees grant entrance for free for two members of their own famillly.